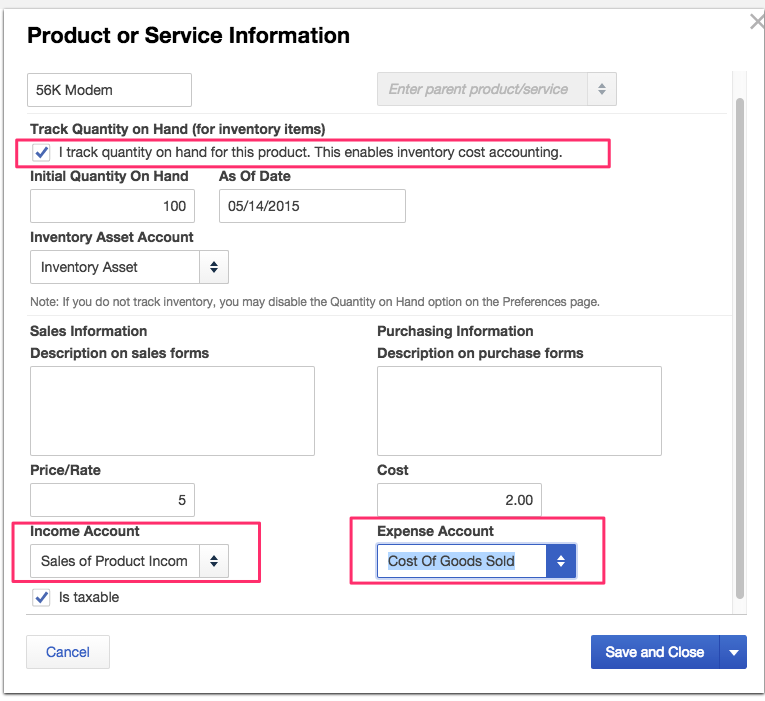 The Quickbooks integration does not support use of "Discount" type items in inventory due to Intuit's irregular treatment of these items in their integration. Products do not sync automatically between the apps. 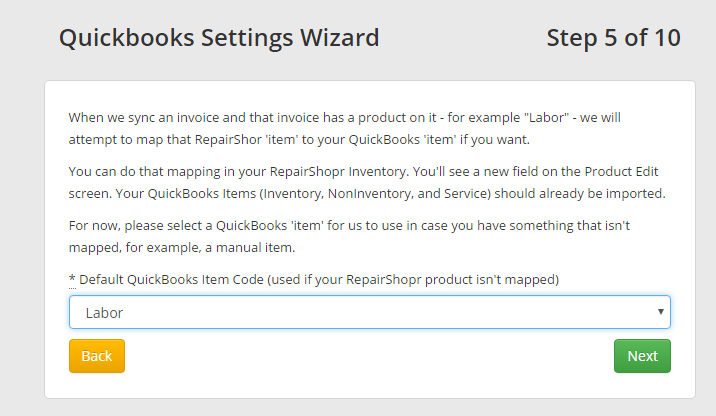 You will need to push a sync from QB to RepairShopr, or create the item on both sides, and map them together on the product in RepairShopr. 4. Reckon (The Australian version of Quickbooks Desktop) is not compatible at this time. 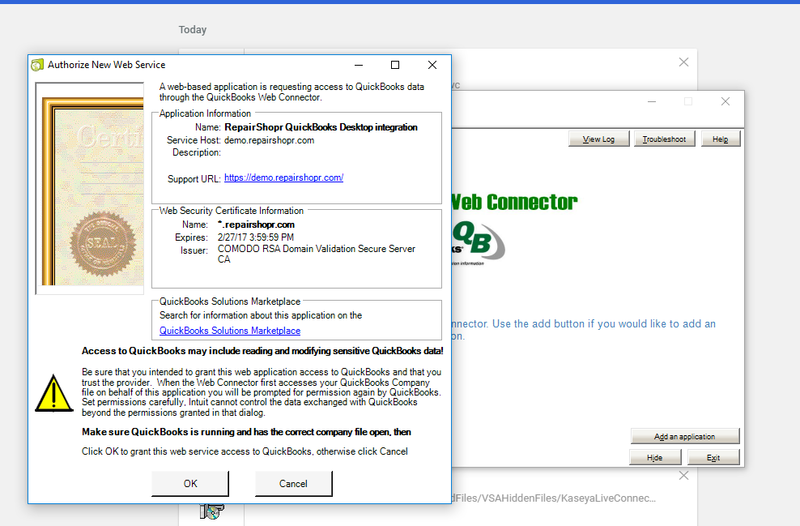 Quickbooks Desktop uses the Quickbooks Web Connector (QBWC) to connect to us. The QBWC runs only on Windows machines. Mac is not supported at this time due to an Intuit limitation. 1B. 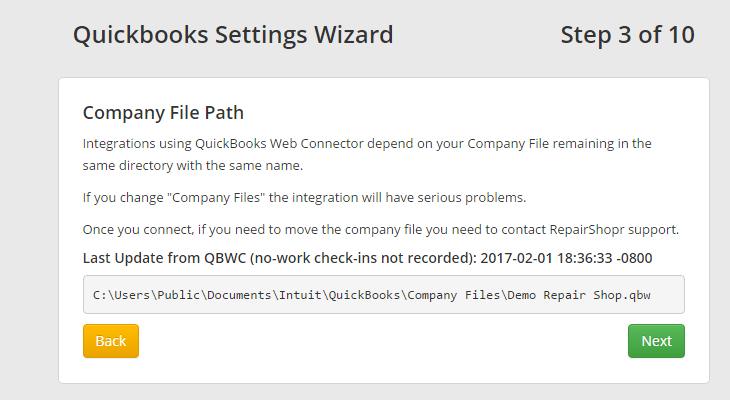 Now you can probably just click "Configuration" to grab the .qbwc file that will setup the link between your QuickBooks company file and the program. Save it, and double-click it to run it. 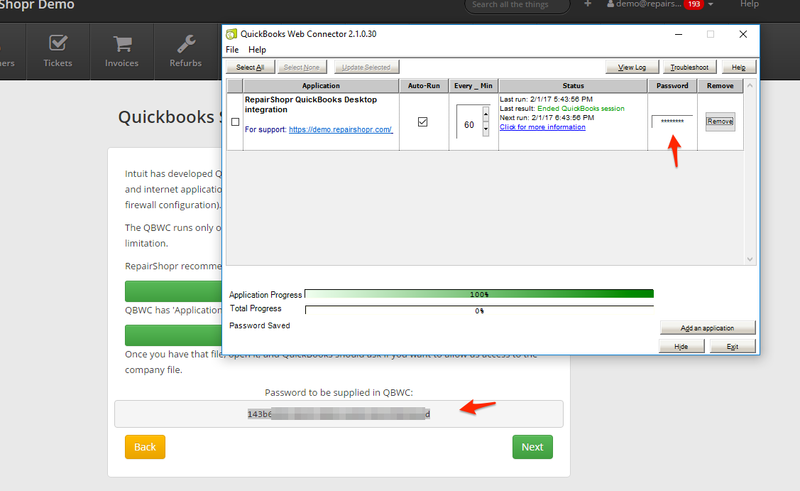 You'll need to copy the password we provide into your QuickBooks Web Connector to the password area shown in the next screenshot. 2. Now it's going to want to do an "Initial Import" - this won't add anything to your QuickBooks file, it just grabs the chart of accounts and such so we can do the mapping in the application. This is safe to do. 3. Step 3 is just warning you that if you move the company file you have to contact support, and confirming which company file you have connected to. 4. 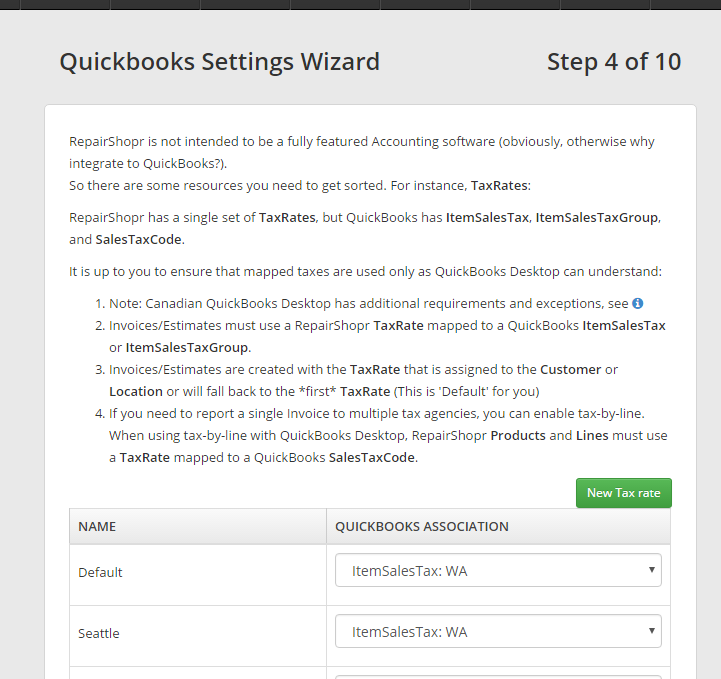 Here you need to "map" your tax rates to QuickBooks "ItemTaxCodes". Map them all to continue. 5. 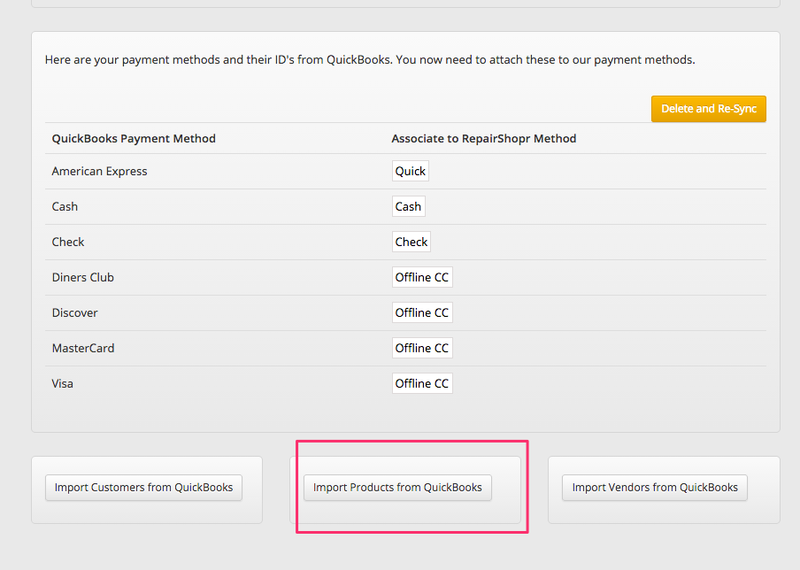 Now setup your "fallback product" that we'll use when you sync an invoice that doesn't have mapped products. This is sort of a safety net to get things to sync if you use a manual item somewhere randomly in your account. 6. 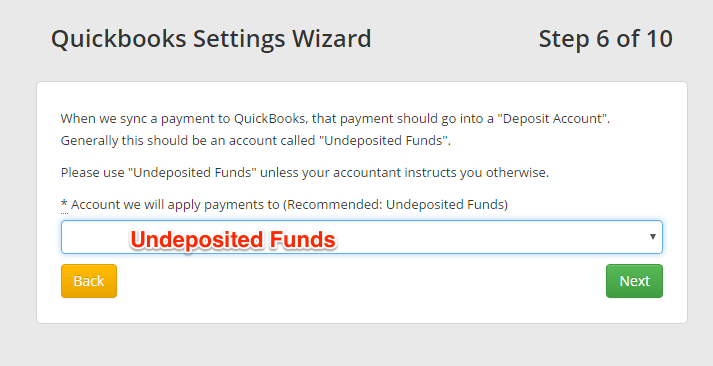 Specify the deposit account, 99.99% of the time it's "Undeposited Funds"
7. 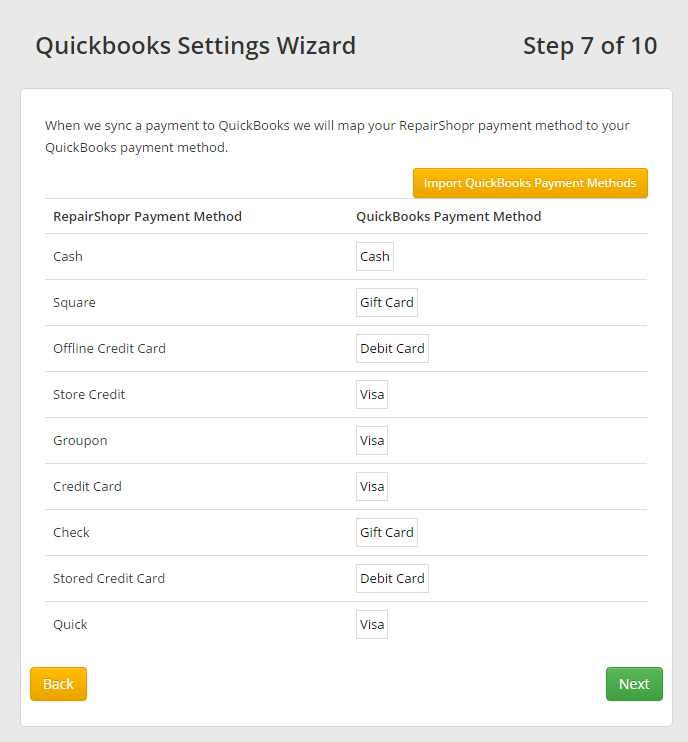 Map your payment methods to some payment methods in QuickBooks. Payments will not sync if these aren't mapped. 8. Almost there! 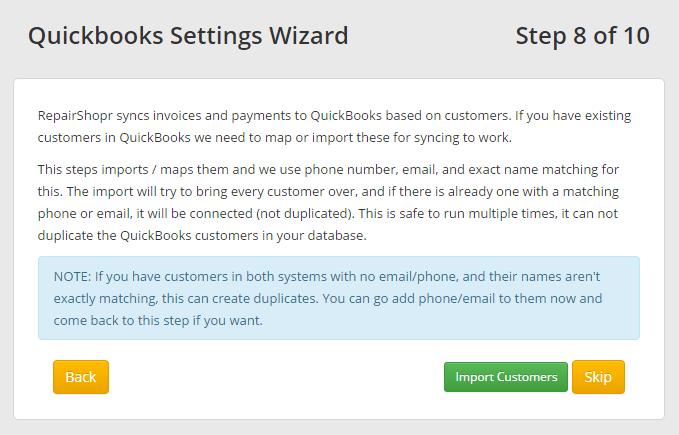 If you want all your QuickBooks Customers to be brought into your account, you can do that here. 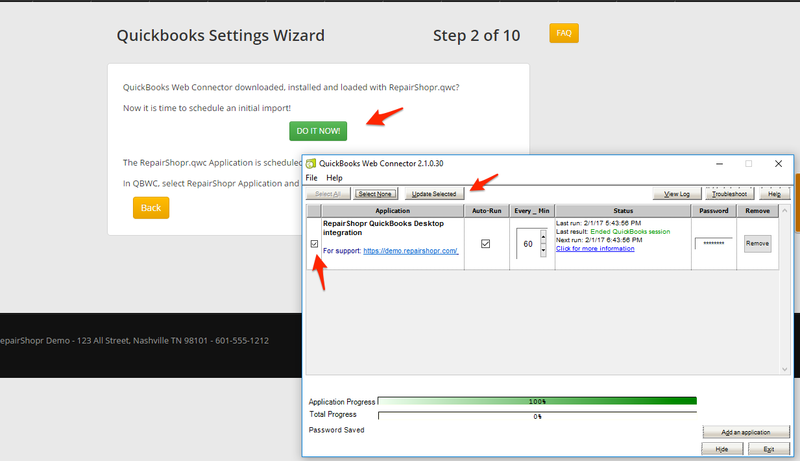 Once you click Import an "import job" will be queued up, the next time the QuickBooks WebConnector runs it will do that import job. It can take a couple hours to do a few thousand customers. 10. Done! Now you can choose to have sync enabled or disabled. If it's disabled, the integration is turned off. 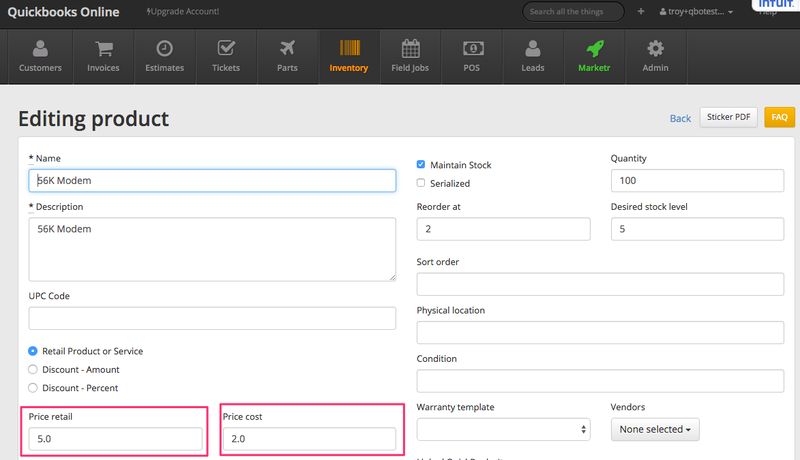 If you enable it, Invoices will begin syncing after they are modified (in the future) - we don't sync historical. How do map Tax Rates to QuickBooks Desktop? The software can map to three different types of QuickBooks Desktop entities, depending on how it is used. We apologize, but at this time Class tracking is only supported on QuickBooks Online. 1. 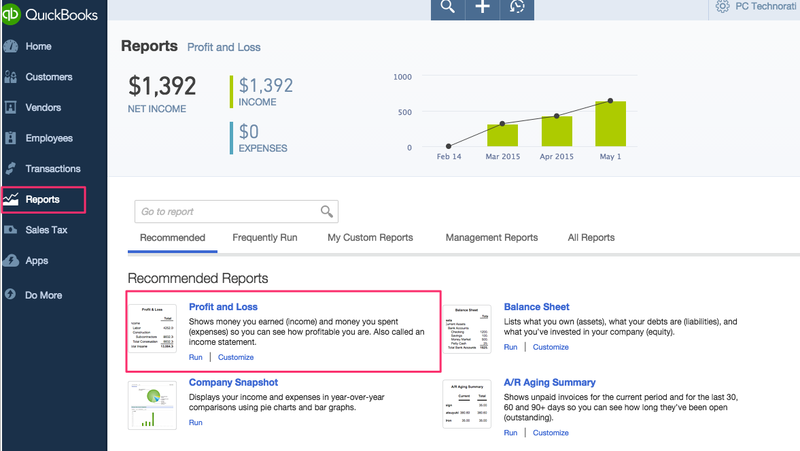 Start by creating a new Product in Quickbooks Online or in your account. The Product/Item imports include "Service, Non-Inventory Part, and Inventory Part” and exclude "Other Charge, Group, Subtotal, Discount, Payment, Sales Tax and Sales Tax Group"
4. 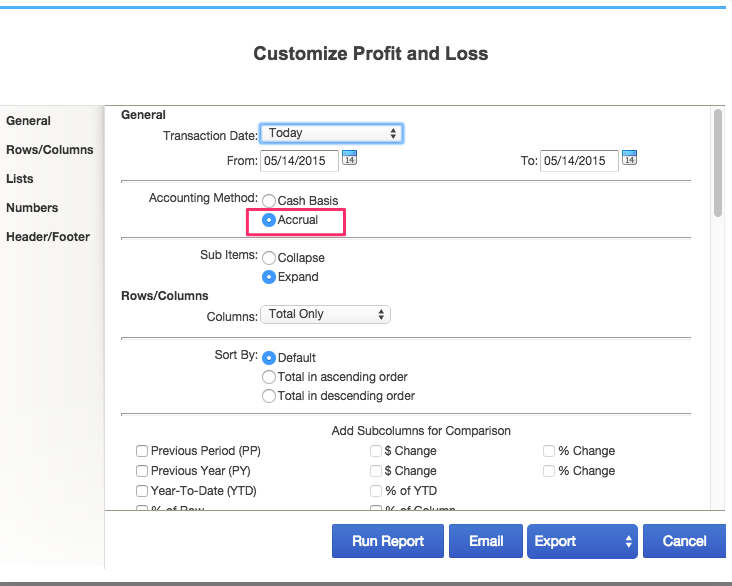 Add the item to an invoice in your account. 7. 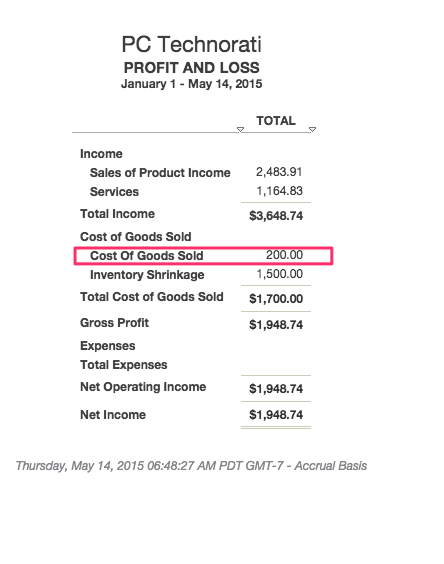 To view the Cost of Goods Sold report in QBD, navigate to Chart of Accounts and search for Cost of Goods Sold. 1. Migrate your data from Quickbooks Online to Quickbooks Desktop. 2. Disconnect Quickbooks Online in your account settings. 3. We'll do some backend changes on our end (please contact us at help@repairshopr.com). 4. 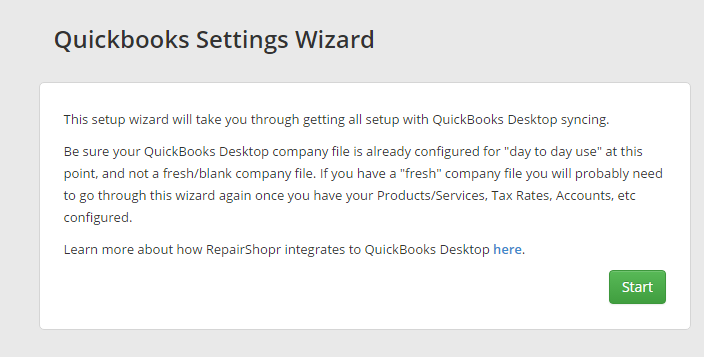 Go through the standard Quickbooks Desktop integration steps. 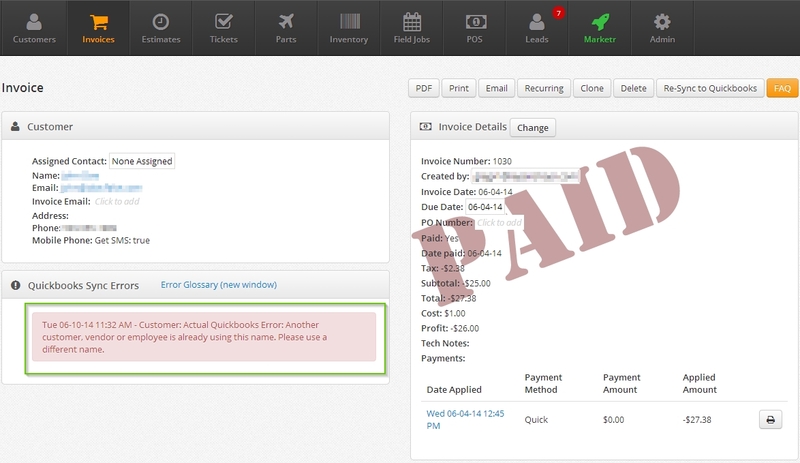 Intuit's QuickBooks Web Connector (QBWC) is a somewhat fragile product in that it is not actively maintained and often surfaces vague error messages. We recommend using QBWC version 2.1.0.30 found here. QBWC was built by Intuit with expectations that the host, file path, and file name of your company file would never change. If at all possible, don't change these things. Unfortunately, a Windows System Restore or an OS re-install can look like a host change to QBWC because of how it and QuickBooks manage data (across files and Windows Registry). QBWC requires an application to supply an OwnerID and FileID which must be unique in QBWC, so the software row in QBWC must be "Remove"d before repairshopr.qwc can be re-added. Contact Technical Support for an alternate repairshopr.qwc if you run multiple accounts that need to connect to QuickBooks on the same host. To protect the data of users who run multiple company files on the same host, Our software takes note of the file path of the first connected company file and asks QBWC to only use that file path. Contact Technical Support if you need to move your company file. 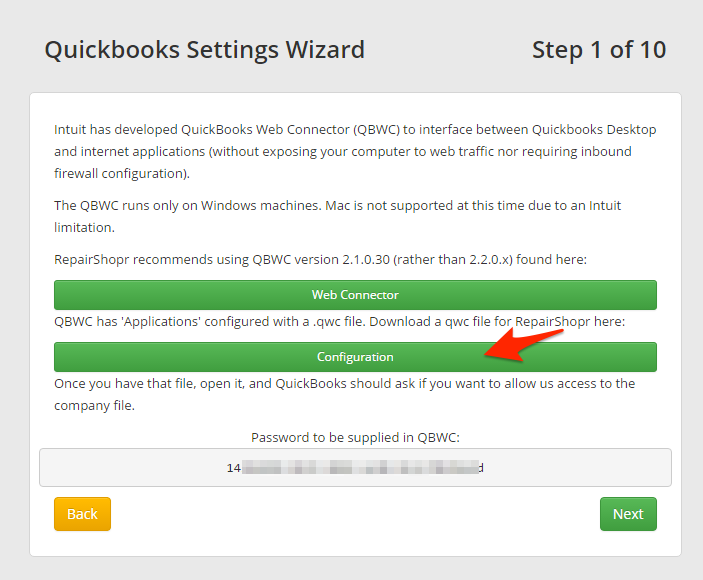 Remove QBWebConnector folder from: '"C:\Program Files (x86)\Common Files\Intuit\QuickBooks\"
double-click your repairshopr.qwc file from your quickbooks/sdk settings page in the account. This error is usually a permissions issue. The web connector needs admin permissions in order to run the connector when the user is on or offline. To fix follow the steps below. 3. Click on "Integrated Applications"
4. Click on "RepairShopr" look at "Properties"
5. Make sure the box that gives "Admin" rights to the application is checked.